One can certainly appreciate the comfort of not worrying about your monthly visitor for the entire nine months that you are pregnant. No monthly cramping, pads, tampons, or moodiness. As much as this is a welcome change, all good things do come to an end, and after your little one is with us, your hormones will have to find their rhythm again, and she (the monthly visitor) shall return. Most women are indeed anxious about their first postpartum period. You wonder whether they will be normal, whether they will be better or worse, and when it is coming back. You have to realize that your body had undergone severe changes. This means that you cannot expect the systems to operate as usual after the pregnancy. Thus, no matter how odd your postpartum period looks like, it is still an indication that your body has started to ovulate normally. Therefore, welcome your first period with open arms. Is it going to be different from before? The arrival of your first post-pregnancy period will depend on whether you are breastfeeding or not. If you are not breastfeeding your child, you can typically expect the return of your cycle within two months. What is considered as normal during postpartum varies widely; your first period can range from heavy to light, more or less cramping, some blood clots and an inconsistent or consistent flow. Your period can be exactly the same to or totally different to your pre-pregnancy phase, and it can vary after each childbirth, as well. Whether you are nursing or not, you are advised not to use tampons until your body is fully healed. Breastfeeding your child has a tremendous influence on your menstrual cycle and fertility. Typically, ladies who are nursing tend to stay for longer without their period, particularly if they are breastfeeding exclusively (meaning they aren’t supplementing the infant’s diet). A lot of females who do this kind of nursing can anticipate being period-free for about six months. However, we are all different; some new moms will wait for over a year while others will return to their cycle quickly. Your inability to get periods while breastfeeding can be attributed to a temporary form of infertility referred to as lactational amenorrhea. Amenorrhea stands for ‘the absence of menstruation.’ Nursing causes the hormone prolactin to be released into your body. This chemical is necessary for milk production but also suppresses your reproductive hormones. See, constant breastfeeding is interpreted by the body as there not being enough resources in the body to facilitate a pregnancy- this is what delays the return of fertility. In fact, breastfeeding can be used as a contraceptive measure during the first six months with 98% accuracy. However, after six months, your cycle might return and you may need to supplement it with another form of contraception. Begin introducing solids. Once the child starts to eat more solids, they may not require nursing as frequently. Start substituting some breastfeeding sessions with an offering from the bottle. At times, these sudden changes to your breastfeeding pattern can induce your cycle. Focus on night nursing. Studies suggest that limiting the breastfeeding window between 12 and 6 AM is the best strategy for inducing fertility. Practice patience. Lactational amenorrhea might be just your body’s way of letting you know that you are not ready for the next pregnancy. It is worth noting that your period, in most instances, will return eventually even when you’re breastfeeding. When your monthly visitor does arrive, it may feel and look unfamiliar. Quite often, your periods after birth will be different than those before you conceived. Figures indicate that a third of females will have their menses staying the same; a third will have heavier menses, and another third will experience mild cramps and bleeding. Also, it is not rare for the first postpartum period to be significantly heavy, with more cramping and pain than you are used to. However, if you notice a dramatic change in your periods, you might want to explore other factors that may cause this; such as a history of the pill. When you are on the pill, the period you get is not a natural one; rather it is that from withdrawal bleeding as a result of your body coping for 21 days with synthetic hormones. Hormonal contraceptives of any kind will tend to cause lighter periods. Thus, the new heavy period post-pregnancy might just be your natural cycle. Additionally, there are other causes for heavy and painful periods which have nothing to do with childbirth, but just being a woman. These factors include weight gain, and uterine fibroids or polyps. When you gain weight, your fat cells produce more estrogen, and this has a significant influence on how long and heavy your periods are. Moreover, if your periods have consistently been heavy and painful since you delivered, you might want to change the focus of your problems from the uterus to the liver. See, when you are pregnant, there is a lot of demand by your body to eliminate waste; yours and the baby’s. This means that the kidneys and liver will work double-duty to excrete chemicals and toxins. The liver’s main job here is to detoxify excess estrogen. Thus, heavy and painful periods could be an indication that the liver is working hard. If cramping is giving you sleepless nights, it might imply that you are deficient in magnesium. Magnesium helps the muscles to relax, and thus a magnesium supplement is recommended. Also, note that magnesium is easily absorbed by the body with no side effects at all. If heavy periods become routine, you need to visit your GP to rule out all the abnormalities. They could do this by checking for imbalances in your hormone levels. For instance, disproportionate levels of progesterone to estrogen could be a cause. Also, you need to get tested for anemia due to the heavy loss of blood. Thus, you need to supplement with iron if you are menstruating heavily. No matter the means of delivery, you should expect some vaginal discharge and bleeding after giving birth. This is because the body is shedding tissue and blood which lined the uterus when you were pregnant. In the initial weeks, the blood will seem more substantial and in clots. After several weeks, however, the blood will give way to vaginal discharge referred to as lochia (a bodily fluid that appears creamy white to clear in color). You may continue to have this discharge for about six weeks- which is the average time required for you to start ovulating if you are not breastfeeding. If lochia appeared in your release then you immediately started bleeding, this is an indication of your period and it is not a pregnancy-related bleeding. Hey, this mom shared with us her experience with the first period after baby, it can be interesting to watch the video below. 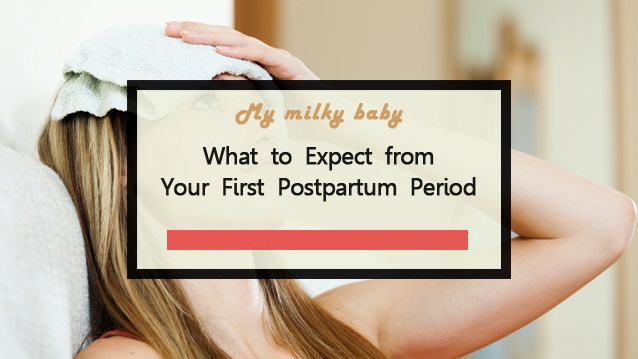 Postpartum periods often take a while before they are regular again. This is because your hormones are still trying to self-regulate and calibrate. This means that you will have periods of very short or very long cycles, or even go for months without a period. Also, note that you may require changing your menstrual products after giving birth. You will find tampons to be irritating, and you might need to substitute them for heavy-duty pads, you can find an example here. Additionally, if you use menstrual cups, you will probably have to switch cup sizes. Often, people have commonly mistaken bleeding right after birth as their first postpartum period, but as we debunked earlier; this is just postpartum bleeding. Breastfeeding is not a foolproof way of preventing pregnancy; you might still within a few weeks of giving birth. You can learn more about postpartum hemorrhage in the video below. The above signs could be an indication of a retained placenta, tubal pregnancy, or infection. Visit your physician. Your menstrual health needs always to be a part of the conversation you have with your specialist. If your period does not return after a couple of months after giving birth, you didn’t breastfeed, or you stopped a while ago, you need to check in with your doctor. Various tests will help troubleshoot and diagnose any issues. Photo & Video credits: Freepik, a little about a lot, Osmose.